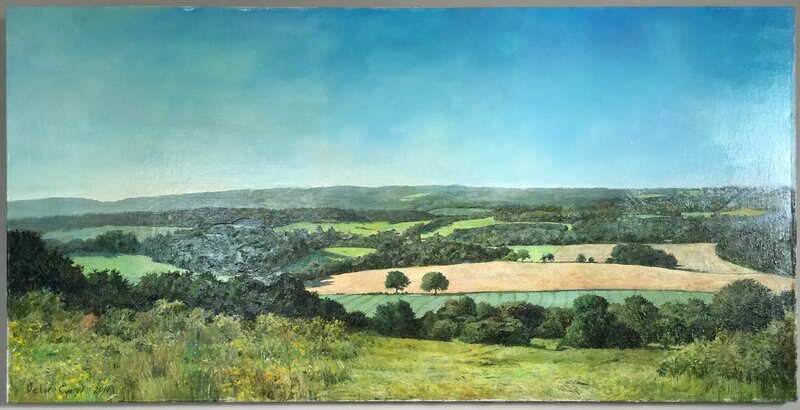 Belgravia Gallery has just taken delivery of this truly spectacular painting of the Surrey Hills in the South of England by renowned Russian painter Victor Egorov. Victor Egorov was born in 1972 in the Urals and qualified with Honours from the Academy of Fine Arts, St. Petersburg in 2005. His realist style remains influenced by the traditional methods at the renowned Academy of Fine Arts and by the 19th Century Russian masters such as Korovin and Levitan, though his most favourite artist remains John Constable. He may be regarded as St. Petersburg's most promising young realist landscape artist. Past exhibitions include: Moscow at the prestigious City Exhibition Hall from 1999 to 2003 and at the Gallery of Modern Art, St. Petersburg 2003 and 2004. Following Egorov's successful series of paintings based on Verbier, Switzerland, this new collection of works will be most exciting.